Rinse and drain the quinoa. Place in a medium pot and add the water. Bring to a boil, reduce to a simmer, cover, and let cook for 15 minutes or until nearly all water has been absorbed. Remove from heat and let stand 5 minutes. Heat a grill pan or grill to medium heat. Rub the steak with olive oil, salt, and pepper. Place on the skillet and grill until steak is medium-rare or medium, roughly 5 to 7 minutes per side, depending on preference and thickness of steak. Remove from the grill pan or grill and let rest for 10 minutes. Thinly slice, about 1/4” (3/4cm) thick. 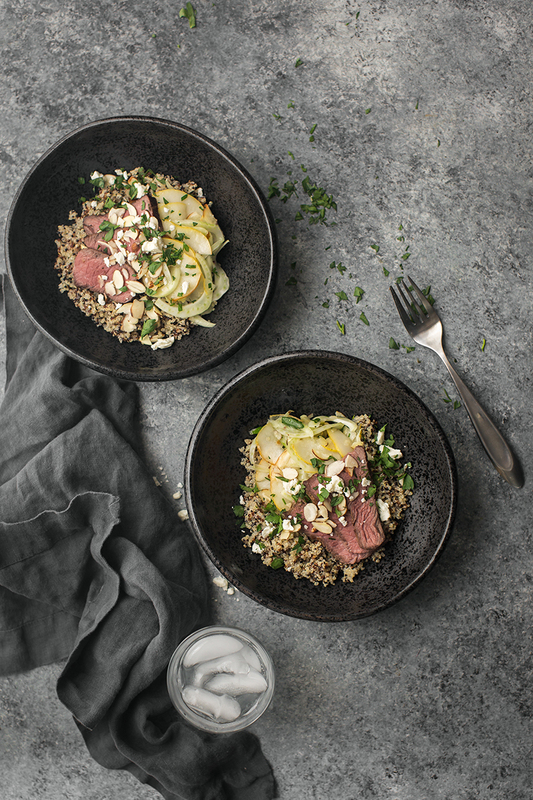 While the steak and quinoa cook, thinly slice the pear and fennel. Place in a bowl and add the parsley, feta, and almonds. In a small jar with lid, combine the olive oil, lemon juice, honey, salt, and pepper. Shake until well combined. Pour over the pear salad and toss until the salad is well combined. Set aside and let rest. Assemble the bowls by dividing the quinoa into four bowls. Top with salad followed by sliced steak. 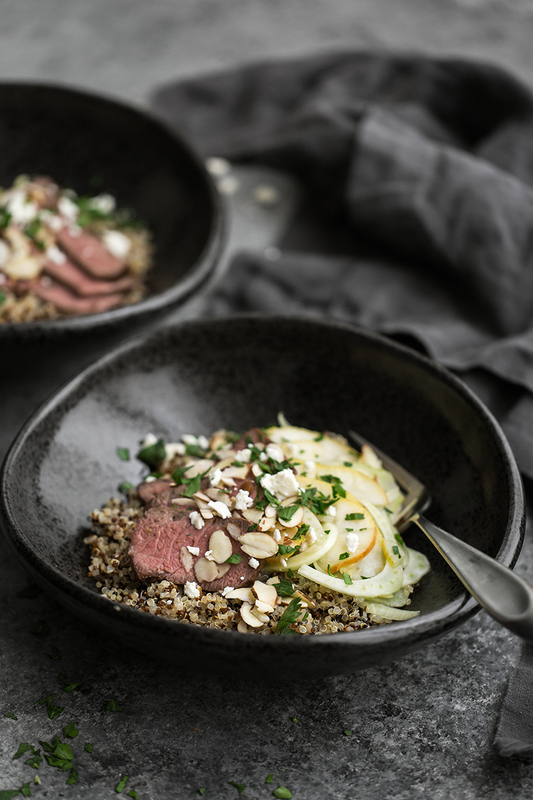 Sprinkle with parsley and extra almonds, as desired, before serving. 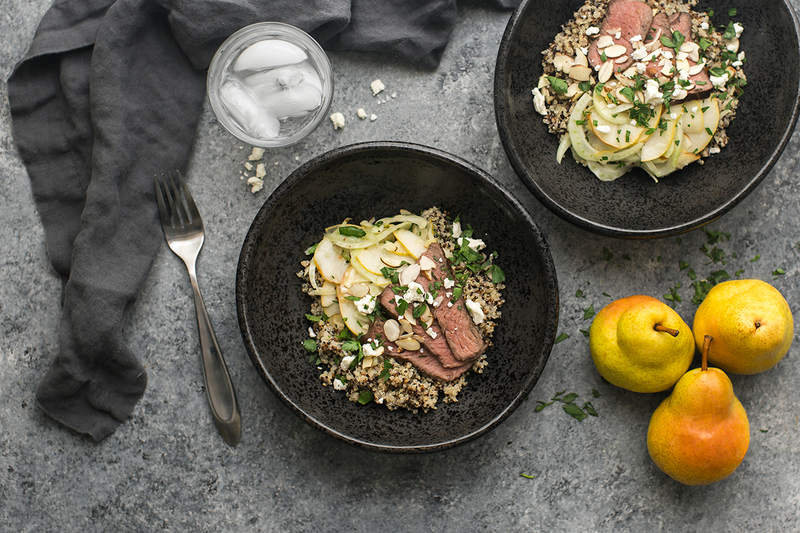 Shred or grate the pear and fennel if you do not own a mandoline.